This report covers conditions and observations made on Thursday, February 12, 2015. The first picture shows a down the row view of a Nonpareil and Aldrich planting exhibiting very nice bloom overlap, while the second frame we can see that growers are continuing fungicide treatments. 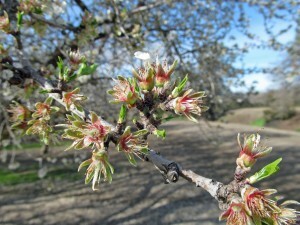 The third photo shows a close up of Sonora buds that have lost their petals and are in the jacket. A pattern of outstanding weather got even better in the Sacramento Valley with morning temperatures in the low 40’s quickly giving way to afternoon highs in the low 70’s. Low winds under clear skies made for another excellent day in the northern region. 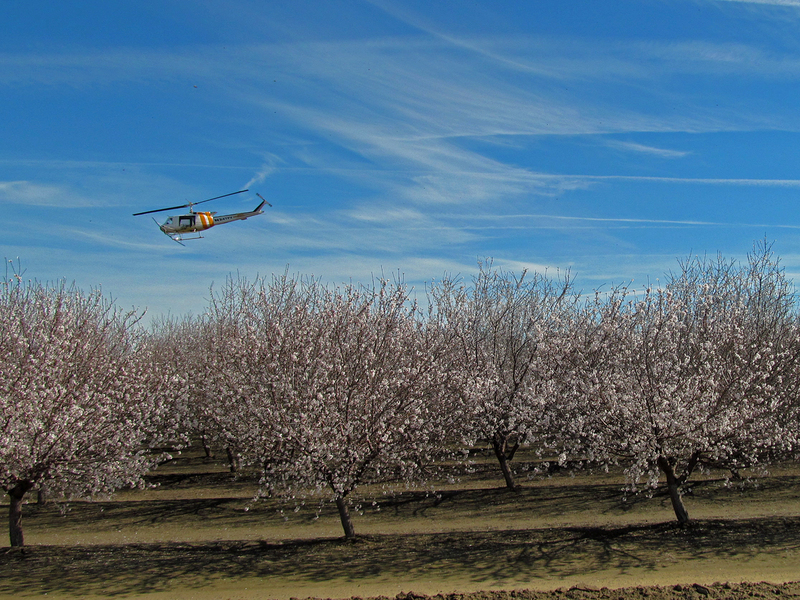 The beautiful weather spurred bud development and increased bee activity. The smell of pollen was evident in the orchards and observers noted that today had the best bee activity of the season, as orchards were humming with bees for almost 8 hours. Timing could not have been better as flowers are rapidly presenting for pollination. 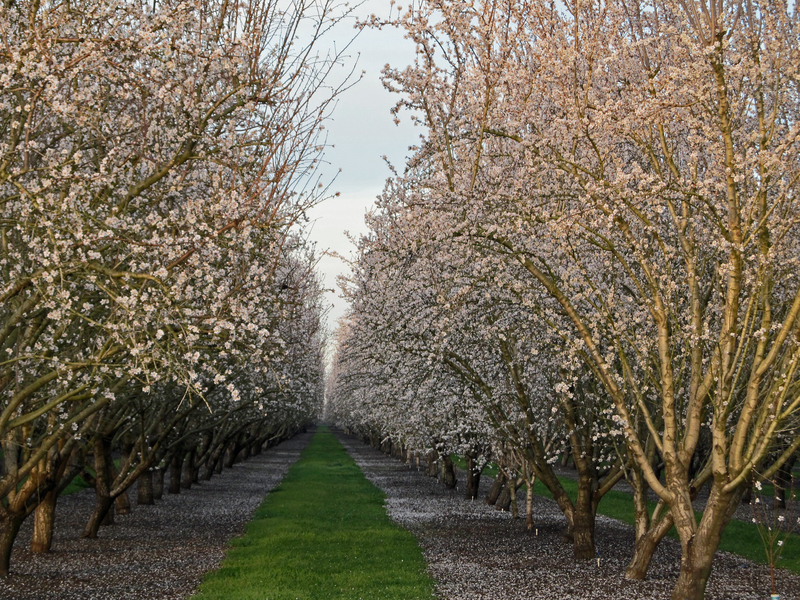 Trees are rapidly approaching peak bloom in the northern region. 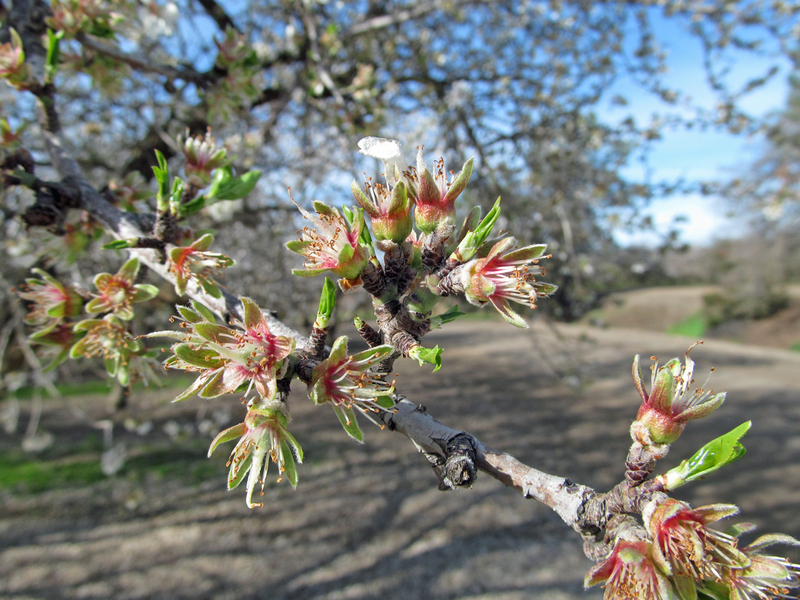 As represented in the third picture, most of the early blooming Sonora variety are beginning to lose their petals and will likely hit peak bloom today. The Nonpareil cultivar is only about 3 days behind with flowers presenting for pollination at a rapid rate. 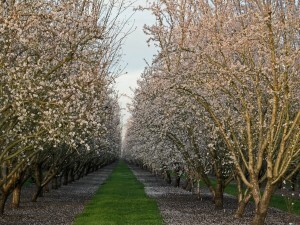 California type varieties and Monterey are roughly a day ahead of Nonpareil which is leading to a nice overlap in bloom, represented by the first picture. The Carmel variety continues to lag about 2 days behind the Nonpareil with only about 15% of flowers presenting for pollination. The excellent weather has spurred on the late blooming Butte and Padre cultivars. Both varieties now have measureable flowers presenting for pollination with very few dormant buds remaining. As seen in the second picture, fungicide treatments continue to protect flowers from disease. There are now plenty of flowers open to make an effective application. Meanwhile storms from the past weekend have pushed off the need for irrigation in the northern region.